The Fiamma Wall Kit Box allows you to install a Fiamma Ultra-Box directly to the rear wall of a motorhome or camper without the need for a Carry-Bike. 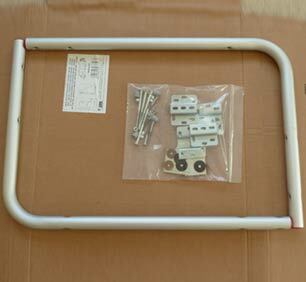 It is a wall mounted support kit for the installation of Fiamma Ultra-Box 180, 360, 320 and 500 boxes. Consisting of 2 'L' brackets made in anodised aluminium, it safely supports the weight (further info below) of the Ultra-Box and its contents. The Ultra-Box fits to the Wall Kit Box using the Carry-Bike installation kit supplied with the original Ultra-Box (not supplied with the Wall Kit Box). 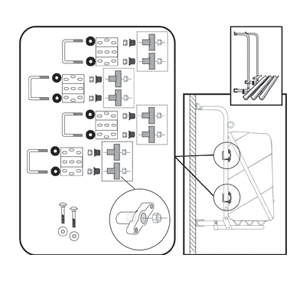 The kit supplied with the Wall Kit Box penetrates the wall completely for a thorough and secure fit. The maximum loading weight of the Wall Kit Box should not exceed 60kg, this includes the weight of the Fiamma Ultra-Box. However, not all motorhomes and camper vans will be able to tolerate even this weight, so we strongly recommend you check with the manufacturer of your particular brand and model of camper van or motorhome first. Vertical centre distance: 475 mm. Max. 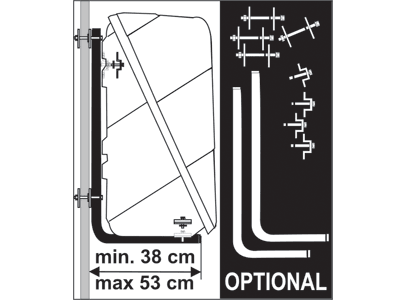 capacity: 60kg (subject to wall structure). Fitting: Supplied with through-the-wall installation kit.